High Efficiency Air Source Heat Pumps deliver four-season comfort in one unit. They cool your home like an air conditioner in summer, and warm it in the winter like a furnace. 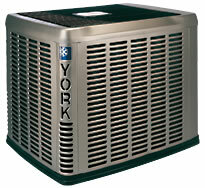 The Affinity Series is the premier York line of residential heat pumps. Unlike standard heat pumps, York 8T, 5T and 3S heat pumps deliver air that is warm to the touch above normal body temperature. This “Hot Heat Pump” technology uses innovative compressor and control technology to increase room comfort by eliminating cold drafts when the system starts. What’s more, this innovation actually helps reduce energy costs. For quiet comfort, QuietDrive™ reduces operating noise and expenses with a high-efficiency compressor, isolated compressor compartment, swept-wing fan design, and composite base pan. York backs every Affinity™ heat pump with one of the best limited warranties you’ll find: Every Affinity™ heat pump is backed with a 10-year parts* warranty and a 10-year compressor warranty. Our optional YorkCare™ comfort plan offers up to 10 years of total parts and labour coverage. And, if you purchase our Affinity™ 5T or 8T model with a factory matched Affinity™ gas furnace, coil, and/or air handler, you’ll receive our Total Package Warranty program: A 10-year limited parts warranty and a lifetime compressor warranty. This model is rated 18.0 SEER.